Many states have legalized marijuana for medical and recreational use. However, many states still follow the federal law, which criminalizes marijuana. Florida is one state that has not yet legalized the drug. This has not stopped certain cities within the state to legalize it, though. Lawmakers are also trying to finalize laws regarding growing marijuana and using it for medicinal purposes. This has led to confusion among Florida residents. So in terms of marijuana use and possession in Florida, what exactly is legal, and what isn’t? Amendment 2 was passed in Florida last year. This increased access to marijuana for more patients with medical issues. Full-strength marijuana is now legal to those suffering from a “debilitating medical condition.” This includes diseases such as cancer, HIV, AIDS, glaucoma, epilepsy, Parkinson’s disease, Crohn’s disease, multiple sclerosis, PTSD and ALS. This does not mean, however, that you can simply buy marijuana from a dealer on the street and use it to medicate. There are seven nurseries across the state that work with dispensaries to process, sell and market the drug. Note that Amendment 2 was designed to allow marijuana for medicinal purposes only. Recreational drug use is not permitted in Florida. Those who smoke it in public—even while driving—can be arrested and convicted of a drug crime. While Orlando has decriminalized small amounts of marijuana, police officers have the discretion to cite you or arrest you for the offense. If you are caught with 20 grams or less, you could receive a $100 fine, with the option to waive the fine by attending a substance abuse program or performing community service. The traffic stop was conducted without probable cause. The police officer searched you or your possessions without probable cause or consent. The police officer violated your constitutional rights. The police officer violated your Miranda rights. The marijuana was not in plain view. A marijuana possession conviction can ruin your future. It can result in license suspension, even if you were not driving when the arrest occurred. You could also face punishment such as community service, a $1,000 fine and up to one year in jail. This conviction will stay on your record for many years and disqualify you from financial aid and public employment. 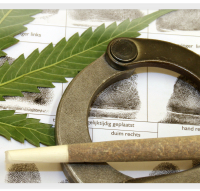 Let the Dade City criminal defense attorneys at Mander Law Group defend your marijuana case. We are aware of many situations in which marijuana can be suppressed or thrown out of court completely. Schedule your free consultation today by contacting us at (800) 557-0411.